Congratulations on your engagement or the engagement of a loved one! Weddings are always full of joy, but they can be a source of stress if the right steps aren't taken to ensure that the big day runs smoothly. If you should need help planning your Jacksonville wedding, then let our team help you make your day perfect. We will work with you to figure out your needs and can offer you a CAD drawing catered to your special day. 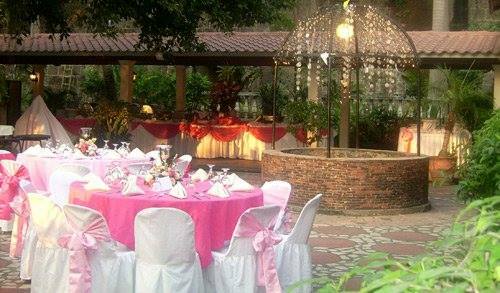 Location is always a key aspect when planning since it'll give the overall mood for your wedding. Don't forget that any place can become a dream location with tents and accessories from United Rent All Of NE FL Inc.
How many guests will be attending your wedding? Will there be dancing? This will determine the size of your tent, as well as how many tables and linens you'll need. If you have questions you should speak with one of our trained Jacksonville professionals at 904-771-3300. This will help you decide and reserve candelabras, linens and other accessories. Will white, brass or silver look better with your color scheme? For your convenience, you may view and print our "Bride's checklist" below! To learn more about how United Rent All Of NE FL Inc can help you with your big day, call us today 904-771-3300. We look forward to hearing from you.